Cloud computing is internet-based computing that provides shared processing resources and data to computers and other devices on demand. It is a model for enabling ubiquitous, on-demand access to a shared pool of configurable computing resources (e.g., networks, servers, storage, applications and services) which can be rapidly provisioned and released with minimal management effort. Cloud computing and storage solutions provide users and businesses with the capability to store and process their data in third-party data centres. [] It relies on sharing of resources to achieve coherence and economy of scale, similar to a utility (like the electricity grid) over a network. 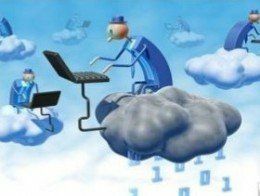 Cloud computing has become a highly demanded service or utility due to the advantages of high computing power, cheap cost of services, high performance, scalability, accessibility as well as availability. Some cloud vendors are experiencing growth rates of 50% per year. Massive infrastructure investment from global IT giants such as Microsoft, Google, Amazon and IBM has enabled Public Cloud using internet application delivery through Software as a Service (SaaS). Organisations now have the opportunity to leverage these investments and the competitive landscape to access services as and when required and provide agility, innovation and scale to the systems they use. Moncrieff’s locally-based services and solutions allow organisations to mitigate the potential risk of moving business processes to Public Cloud infrastructure or utilising SaaS. Moncrieff hybrid cloud is built on reliable infrastructure and is continually monitored and upgraded. Security and business continuity is paramount with robust back-ups including data held on mobile devices. Reduce Capital Investments: Remove the need for ongoing investment in IT infrastructure. Simply choose from a subscription or a pay-as-you-go plan — whichever works best for your organisations’ financial circumstances. Budget Flexibility: Cloud computing allows you to vary the size of your computing and storage needs as your requirements fluctuate. Anywhere Access: Cloud is very much an enabler for mobility allowing access to files and application no matter what the location. M. Haghighat, S. Zonouz, & M. Abdel-Mottaleb (2015). CloudID: Trustworthy Cloud-based and Cross-Enterprise Biometric Identification. Expert Systems with Applications, 42(21), 7905–7916.